Cooking spray is great, but leaves a serious mess on everything! What is the point in saving clean up time on pans when I just ended up having to clean the counters or sink of over-drawn? I used to spray my pans outside, but this was just an aggravation while I was trying to cook. Then one day it occurred to me to spray my pans over the open dishwasher door! 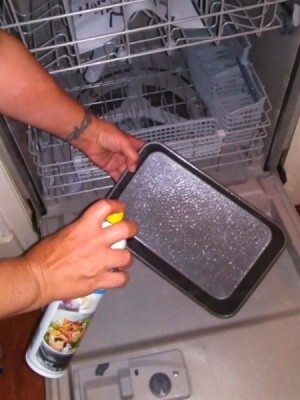 Any over-spray gets cleaned up the very next time that I run the dishwasher, no extra work required! Anything that saves me time gets my vote! Thanks for posting.